Even most of the intelligent ones believe in, or want to believe in, some form of mysticism. They want to believe that some incantation, some magic combination of words, some ritual will be the effortless and almost instantaneous solution for all their problems. When in fact, most of their problems are caused by a lifetime of poor decisions. …some secret society of shamans who perform mind-blowing miracles is going to save you. 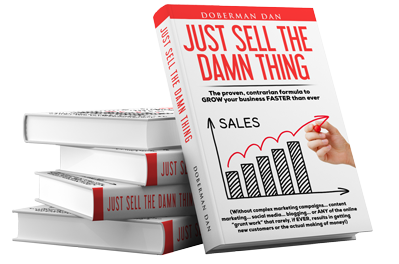 And exactly how to get results like this is what the knights in my Marketing Camelot are about to discover in the June issue of The Doberman Dan Letter. I’m revealing all the “mind control” copywriting secrets gleaned from cult leaders. It’s the little known “dark arts” secret to getting the highest possible conversions. Listen, I gotta tell ya, this issue of The Doberman Dan Letter is only for the REAL players. ‘Cuz it’s gonna get heavy. And when that happens, the sheeple always tuck tail and run. I hope that doesn’t describe YOU. Because you’re about to discover some deep dark copywriting and persuasion secrets that you’ll rarely, if ever, hear from any other marketers or copywriters. Because the infinitesimally few who understand it and know how to use it are probably scared to death to reveal it. Actually that’s an understatement. It’s 100-megaton hydrogen BOMB powerful! And yes, in the wrong hands it can be used for evil. Heck it has and currently IS being used for evil. It can enrich the lives of others beyond anything they’ve ever dreamed possible. And you can use this stuff to transform the lives of hundreds, thousands or even millions of people. And make an absolute frickin’ FORTUNE for yourself in the process. Listen… I passed my “10,000 hour” mark in copywriting over a decade ago. I’ve made personal sacrifices time and time again to get good at this stuff. EXTREME sacrifices I’ve never seen ANYBODY else make. I’ve invested 7-FIGURES in my copywriting education. I’ve bought and continue to buy every single copywriting book and course I can find. Yet… I’ve never seen ANYBODY reveal what I’m revealing in the June issue of The Doberman Dan Letter. No, not even my mentor Gary Halbert has ever revealed this. IF you can handle it… this issue is gonna be a game changer. It’ll be mailed out to my knights by the end of business this Thursday. If you don’t want to miss out on this monumental issue of The Doberman Dan Letter… click here immediately. Next post: Ready for a total mind f*#k?